Speaking of basketball in Almeria is to speak of CB Almería. A club that has over 40 years of history in the province. They form 13 teams, plus 7 training schools, a total of nearly 900 players. CB Almería is also a committed club; in March of this year, it has been awarded with the Distinction for Equality of the Andalusian Institute for Women. ISE has worked this year with the sponsorship of the women’s National team League 2 SYNGENTA ALMERIA CB which has curdled a great season keeping the category. 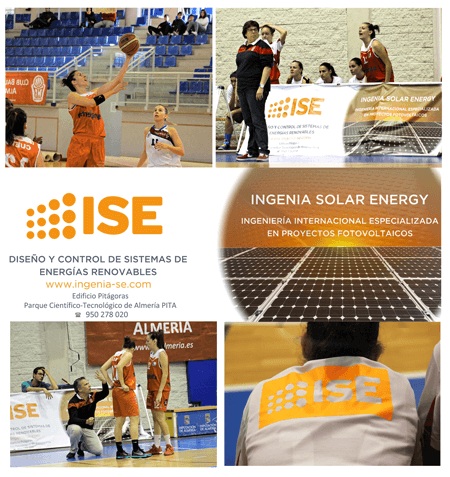 Ingenia Solar Energy committed to a quarry team that has managed to compete against teams of maximum prestige and national reference, with much higher budgets and international players. A tremendously competitive league, supported by a great hobby. ISE has decided to bet on this club, Almerías basketball logo, sponsoring the efforts of so many young promising playing basketball in this city.